With the heady fragrance of fresh truffle wafting from the kitchen, my mouth waters as I await the plate of handmade tagliolini pasta that will soon be coming my way, while sunlight filters onto the patio. It’s easy to think that this is the perfect Italian hill town. But then, there are so many to choose from. I’m in Umbria, the region that lies between Rome and Florence at Italy’s geographic center, and this is my third hill town today. The problem with Umbria isn’t that gems are hard to find. It’s that there are too many. The region has a seemingly endless supply of utterly charming towns and picture-postcard landscapes. Umbria, like neighboring Tuscany, is covered in rolling hills quilted with cultivated fields, tracts of vineyards, squares of olive groves, and stalks of sunflowers, all stitched together by lines of trees. With its Renaissance splendor, medieval monuments, and art-adorned churches, Umbria has been dubbed “the New Tuscany.” But I think, rather, it is the “old” Tuscany; Umbria clings to its agricultural roots and old-time traditions, to its quiet rhythms and its cultural heritage. 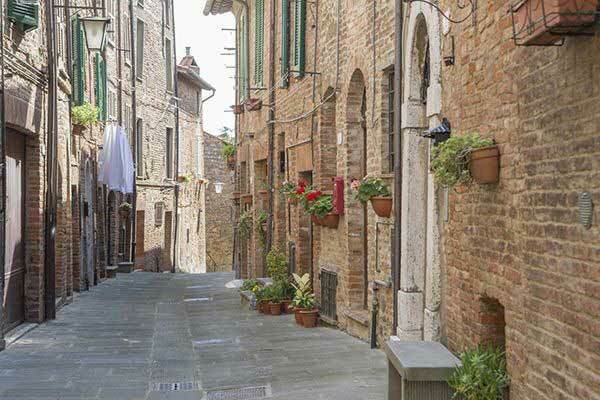 Except for its lack of a coastline, Umbria offers everything that Tuscany does, but at a much more affordable price point. A glass of wine at a bar with snacks can be enjoyed for €4 to €7 ($4.60 to $8). A plate of homemade pasta topped with prized white truffles set me back €10 ($11.50), as did a perfectly grilled super-tender steak of local beef. Pizza and beer for two is a worthy €20 ($23) outing. 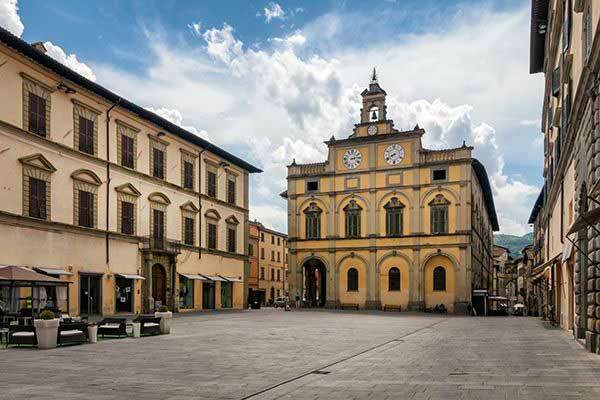 All told, with rent (from just $410 a month), utilities, car insurance and gas, groceries, and entertainment expenses, you could have a pretty charming life in Umbria with a budget of €1,350 (around $1,580) a month. Real estate in this region also won’t break the bank; you can have your own Umbrian idyll for as little as $57,400. This well-kept town is one of those appealing places that is big enough to have everything you need, but small enough to maintain a sense of community. Sitting above the Tiber River valley, Todi has maintained its agricultural economy. The valley is cultivated with grains, the hills with vines and olives. At the center of town is a piazza so perfect it almost looks as though it was made for a movie set. With monumental medieval buildings outlining it, it’s easy to see why it has been named one of the most beautiful piazzas in Italy. And the honey-colored brick buildings cascading down the hillside seem to gleam in the sun. That said, I love Todi’s overall atmosphere; it’s got a warm aura to it and it gets my vote as the friendliest town. People seem to beam; their smiles and sing-songy buongiornos make me think they are genuinely happy there. 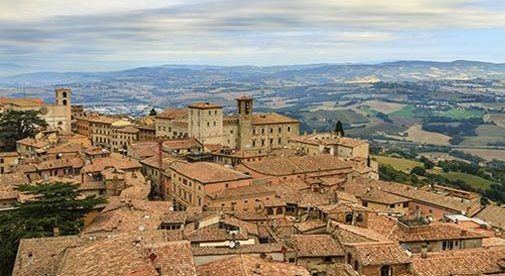 Todi hosts annual events like a tango festival and the week-long Todi Festival, which features art, music, theater, literature, and ballet. It has a velvet-lined, jewelry box-type theater, and a lovely park with tree-lined paths where I watched frolicking kids, mothers with baby carriages, and older gents with cute little dogs, all out for a morning stroll. Outside town is a swank spa resort and sophisticated wineries. I think it would be hard to be a vegetarian in Todi, though; I was lured by enticing smells of grilling meat in all quarters of town. Thick Fiorentina steaks, game meats, and battalions of chickens slow-roasting over open fires are some of the mouth-watering delicacies to be savored here. As if Todi’s perfectly kept old town wasn’t enough, its setting among some spectacular woods and surprising river canyons gives it a natural appeal, as well. It’s also in a near-perfect “triangle,” only 50 minutes from Spoleto, Perugia, and Orvieto, if you want to get out for the day. 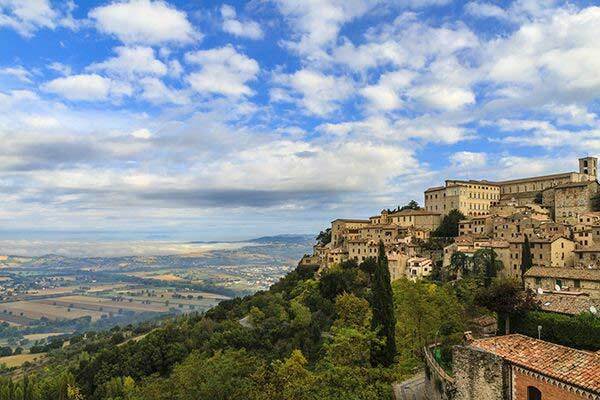 Todi has some surprising real estate bargains, too. Nice rental apartments start at just €350 a month. A cozy, bright, one-bedroom apartment right off the piazza, with wood-beam accents and a spacious storage room, lists for €49,000 ($57,357). An open-plan three-bedroom, two-bathroom apartment in the heart of town, just steps from the piazza, with terracotta floors, a fireplace, and a small balcony that offers views over the rooftops and the countryside, is available for €149,000 ($174,412). See: Todi-immobiliare.it. Honestly? This one’s my favorite. It’s the town I would pick if I were to move to Umbria. Unfurling itself across a ridge, it is elegant and graceful, yet friendly and easy-going. It doesn’t plunge, but rather creeps down the hill, spilling over just enough to exude hill-town ambience without being steep enough to hurt your legs. It has a refined air, with its provincial palazzi, panoramic overlooks, and Renaissance-era appeal. The cathedral and other churches were decorated by hometown hero Pietro Vannucci, the Renaissance master known as Il Perugino (a bit inaptly nicknamed, since he wasn’t actually from Perugia). His most famous work is in the Sistine Chapel, but he certainly endowed his own town with many masterpieces, as well. Looking out to the northwest, the land melts into Tuscany; of course, it’s impossible to distinguish the difference. In this part of Umbria, the hills are softer and the valleys shallower. Silvery olive trees glisten in the sun; stripes of vines streak the fields, and the sunlight gives off an ethereal golden hue. In town, there are homey trattorias, everyday coffee bars, and high-end wine bars. An opulent theater hosts performances, and there are events throughout the year, including a blues festival and a tasty saffron fair, showcasing the town’s prized product. Pieve is known for growing saffron, so you’ll find creamy risottos and pasta sauces with the fragrant, vibrant herb. But don’t discount the savory, scrumptious wild boar sauce that’s made here, served on thick pappardelle pasta. Despite its location at the Tuscan border, real estate prices are reasonable. One that really caught my eye was a cute, newly redone loft apartment in the town center. It makes the most of its small space of 550 square feet, with a fireplace, wood floors, and skylights, priced at €90,000 ($105,349). See: Casa.it. I also saw a lovely country cottage just a few miles from town with three bedrooms plus a separate two-bedroom apartment, terra cotta floors, a large patio, more than three acres of land with a huge garden offering views of the hills, along with woods and some olive trees, for €248,000 ($290,296). See: gate-away.com Rents start at a bargain €330 a month. A house with a pool is renting for just €500 ($585) while an apartment in a palazzo complete with frescoes is listed at €650 a month ($702). This city of about 40,000 people sits along the Tiber River, just south of the Tuscan border. The old town is cradled in ancient protective walls and dotted with Renaissance palazzi, while its skyline is studded with towers. Churches, museums, and civic buildings are loaded with art by heavy hitters like Raphael, Pinturicchio, Pomarancio, and Signorelli. The town center is lively and lived-in; it’s also level, making it easy to get around. Indeed, lots of folks were pedaling around on bikes. I found tempting pastry shops, cafés, and appetizing restaurants, along with plenty of pasted-up notices for upcoming festivals and exhibitions. The city hosts a noted wine festival, a kayak competition on the Tiber, a blues festival, and delectable food events. Truffles reign supreme, so be sure to try some strangozzi pasta with white and black truffles, a full sensory experience. Some restaurants have a full page of dishes bearing the prized tubers. If you’re looking for country living, a totally renovated house that was a former tobacco-drying tower, with a large garden, a jet tub, and 1,615 square feet of space, is being sold fully furnished for €195,000 ($228,257). See: Gate-away.com. Where is Italy on a Map of the World?